We have a few new additions to our lineup. We are now an authorized retailer for Drew Estate Liga Privada #9. Many of you may recognize the name as the parent company for the Acid cigar. This is not part of the Acid brand. The Liga Privada #9 is a traditional cigar created from seven different aged tobaccos from seven different farms. This cigar is medium to full bodied with just a touch of spice. The flavors are rich and smooth. This is a very limited cigar and as of this letter Drew Estate has released this cigar to less than 200 retailers nationwide. Drew Estate introduced the new Liga Privada T52. This is a stalk cut sungrown Habano wrapper with a blend of 7 distinct aged tobaccos. This will be a bolder addition to the Liga Privada #9 and should arrive in October or November. It will be available in a Toro and Robusto size. I will post more information as it becomes available. We just received the La Aurora 100 Anos Preferido #1. One hundred years ago, Don Eduardo León Jimenes, pioneer in the tobacco production in the Cibao Valley, had a vision. He knew that with hard work and perseverance his ambitions would become realities. What began as a dream, with patience and faith, become the first cigar factory in Guazumal, Santiago: La Aurora cigar factory. Today we commemorate a century of its history and traditions with Aurora 100’s. A cigar blended with the best tobacco harvested in the fertle Cibao Valley by tobacco workers that perform their work with love and dexterity that only time and the secret inherited from generation to generation can give. Passing through the most rigorous leaves selection, dried under a fresh shadow and hand rolled by skilled artisans, to offer softness and incomparable exquisite taste to the richest and most select national premium seal; Aurora 100’s is the concrete representation of legendary centennial La Aurora Cigar Factory, symbol of quality and tradition, which has transcended with continuous effort and dedication. The 100 Anos #1 Preferido will only be created once and this will be the only release of this cigar. Be sure to act quickly if you want to experience this limited cigar. Opus X has arrived in six sizes. We have created packs of six, one of each size, and they are priced at $95.00. Reserve D'Chateau Tins, Robusto Tins and Perfecxion X Tins are also available. 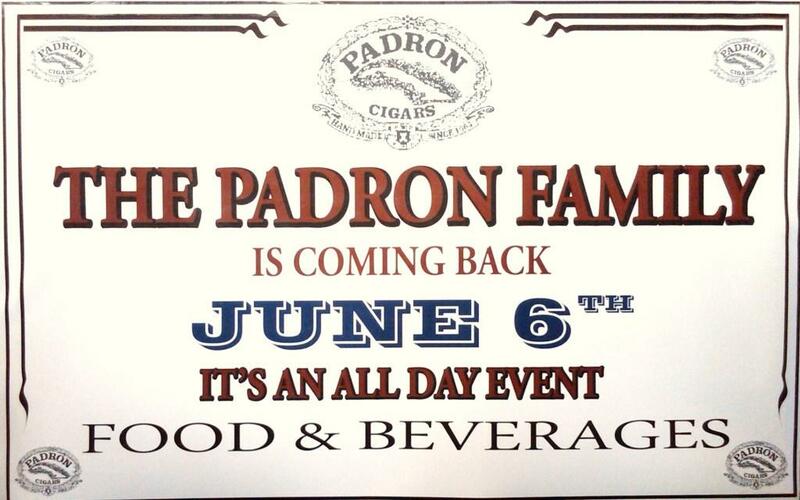 A big thanks to everyone who attended the Padron event on Saturday June 6th. I have uploaded a link to the photos above and on the homepage at www.agcigars.com for all to view. If anyone would like copies burned to CD contact Tom. Jorge and Marcos would like to extend their sincerest thanks for supporting Padron Cigars. They have committed to being here next June and look forward to seeing everyone again. The 5 Sampler packs of Padrons are still available for $44.00 in either natural or maduro. Each pack has a Padron 2000, 3000, 4000, 5000 and a 1964 Anniversary Exclusivo. Also still available are 10 pack Anniversary 1926 in a #2, #6 and #9 sizes. These will make great fathers days gifts. The Padron Family is Coming Back!!! Buy 4 Padron cigars and receive 1 Complimentary Padron Cigar of equal value. You must mention the ***Cigar Lounge Special*** at time of purchase to receive your complimentary cigar. This offer will not be advertised in store. This is a Cigar Lounge Blog offer only. Visit the Cigar Lounge in the future for other daily specials. Don Arturo Gran AniverXario cigars have been aging in the Fuente aging room since 2001. These 7-year-old cigars are finally being released in the Limited Edition Fuente Story Humidors produced by Prometheus. Watch Video Trailer from "The Fuente Family: An American Dream"
MSRP $7,500.00 The MSRP will vary, depending on the tobacco tax and import duty rates in the state or country where the authorized dealer is located. serial-numbered and come with certificate of authenticity. by Cigar Report (November 2008). 93 Rating (Outstanding) from Cigar Aficionado. This promotion is available only at participating authorized God of Fire dealers.